The 9th Paulo Gontijo International Award in Medicine was awarded to Dr. Marka van Blitterswijk (M.D., Ph.D.), assistant professor of neuroscience at the Mayo Clinic (Jacksonville, FL, USA). The award aims to encourage and recognize research on amyotrophic lateral sclerosis (ALS). Dr. Marka van Blitterswijk (M.D., Ph.D.) is an Assistant Professor of Neuroscience at Mayo Clinic (Jacksonville, FL, USA). She tries to understand why there is so much variability amongst patients with ALS, including in the age at which the first symptoms occur, presence of dementia, disease progression, and survival. Most of her patient-oriented research has focused on one particular cause of ALS: a mutation in a gene called C9ORF72. Together with her colleagues, she has examined specific candidates, but she is also using more sophisticated large-scale approaches, to find abnormalities in our DNA and RNA that might account for this variability. These abnormalities could point to promising disease modifiers, biomarkers, and/or therapeutic targets, translating her research into clinical practice. Importantly, Dr. Van Blitterswijks work emphasizes that the explanation is much more complex than previously thought, and that an intricate combination of factors is responsible for the observed variability. Dr. Van Blitterswijk’s work emphasizes that the explanation is much more complex than previously thought and that an intricate combination of factors is responsible for the observed variability. The judgment of the PG Medical Award was made by the International Jurors of the IPG, composed of scientific authorities, both Brazilian and international, involved in the research of Amyotrophic Lateral Sclerosis. The award is supported by the International Alliance of ELA / DNM, MND Association and the European Network for the Cure of ALS – (ENCALS) and is the only one delivered by a Brazilian entity to the international scientific community that researches the cause and cure of SHE. IPG is proud of its previous year’s award recipients who continue to participate in important projects impacting international research that seek the cause and cure of ALS. 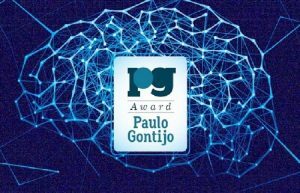 The PG award is also a way of recognizing IPG’s creator, Paulo Gontijo, who is affected by the disease and tireless in the search for his cure.